Exquisite Sterling Silver Engagement Ring with one of our 3.50 carat Russian CZs and 0.25 ctw of side stones down each side. 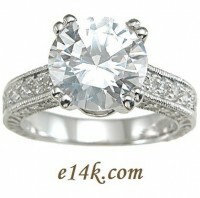 The center Russian Cz Stone is held securely in a 4 double prong setting. Our Russian cubic zirconia stones are more precisely cut & polished from the finest quality CZs. We provide only top quality CZ Jewelry.